slicing cucumbers (Marketmore is the standard slicer, and some of you got a Suyo Long as well, which is a Chinese variety not pictured here that is long, snaky, ribbed, sweet, and tender). pickling cucumbers (Addis Pickle is the variety), a bit on the large size, but they should be fine for fresh eating if you peel the skins off, and pickled I think their slightly bitter skins will probably not be noticeable. Walla Walla sweet onions – These are the designated vegetable of Washington State. Sweet onions are much milder than a yellow onion. Try them quartered and grilled, or raw on a sandwich or burger. collard greens – these giant leaves are still winning the prize for most Jurassic vegetable of 2016. Carrots – just keep on coming! Pink beauty radish – probably the last you’ll see of radishes until maybe a little bit in the fall. Lettuce – a small head of the red leaf Samantha today. I thought we might not have any lettuce ready this week, but these guys are looking really nice at this small size. There will be occasional variations between Monday and Thursday shares based on what’s available, but these posts should give you a pretty good idea of what’s coming on Thursday. If you need some ideas for storing and preparing your veggies, here is one option. 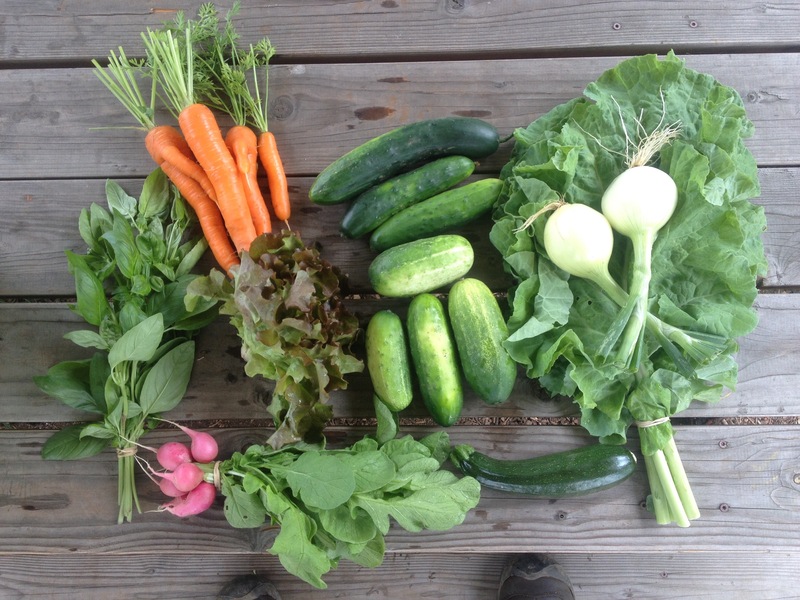 A cookbook called “Bounty from the Box,” specifically designed for CSA members. You can check it out here and use promo code CNF 15 to get a 15% discount on the book as a Cully Neighborhood Farm Customer! I had a nice afternoon handweeding parsnips, celeriac, and celery with three new community farming volunteers. Meanwhile Josh and Martin tackled the cuke trellising jungle in the hoophouse. We found one ripe tomato today, so that means more must be on their way soon! Summer is really settling in!